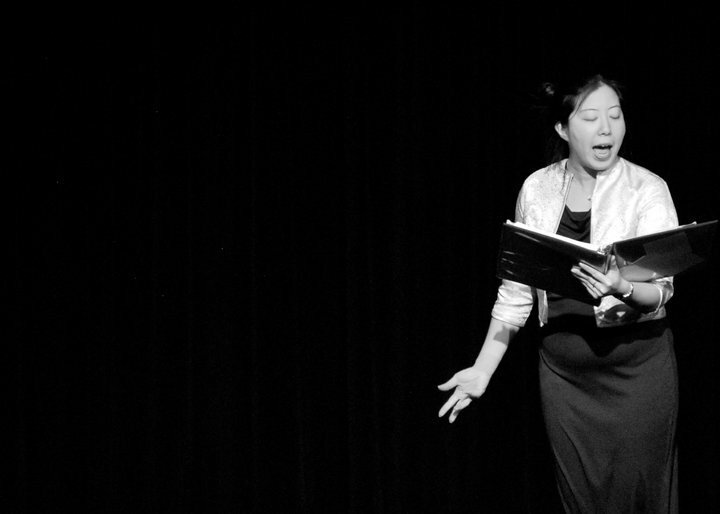 Alexis Wong plays Madam Wu, the brilliant but trampled-upon sister of the Emperor. 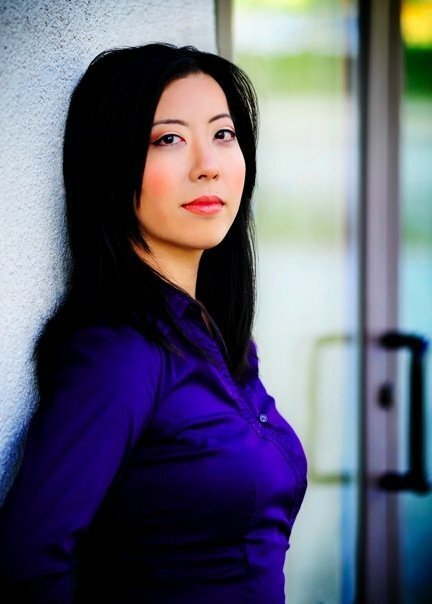 In addition to her day job, she has also worked as a producer for theatre. As you'll read below, she is multi-talented, multi-facted and extremely insightful - and yet so gracious about it all. I was interested to learn more about her performance background as well as how being a producer has helped her as an actor. MIN: Can you describe your day job for me again? I know I've asked many times, but I always seem to forget the specifics. ALEXIS: I'm an online ads campaign coordinator at Warner Brothers Digital Entertainment. Which means I get to look at cool internet properties like Rotten Tomatoes, TMZ, Ellen and Flixster all day long, for work! Originally, I got my degree in architecture and did that for 6 years, mainly working on multiple single home communities for Mount Diablo Habitat for Humanity. Ironically, after getting laid off in 2009, it was my theater hobby that took me in my new path. A friend whom I had done a show with was looking for someone to work with her at Flixster, and I applied and got it! I've been there ever since. M: Tell me a bit about your performance background/history? How did you get into theatre in the first place? A: I was your typical quiet high school academic; throughout primary school I played violin, and then swapped it out for viola in middle school. I never joined choir because I was pretty scared of being singled out and I was taking two electives my senior year already. I always loved singing though; while I'm not revealing where you could get it, there's a recorded phone call of me warbling the Lea Salonga part of 'A Whole New World' at 13. And I'm pretty sure I drove my college roommates crazy singing 'Reflection' [from Mulan] ad nauseum. When I was 22, I happened across a vocal class at the, now sadly gone, SF Music Center, taught by Richard Nickol. Richard was one of the few teachers who had the credentials and chops to teach: opera, musical theater, jazz, rock and pop. It was an incredible turning point for me, Richard took the shy, bookish girl who loved to sing and really brought out the true performer and musician. He taught me that anything was possible with patience, training and faith. I originally came to Richard because I wanted to sing rock music - but ended up really falling for musical theater. I studied with Richard for nearly 10 years up until he passed away in 2012. Since starting my training, I've been performing in everything from experimental theater, cabarets, new works - I just finished Vienna Teng and Tanya Schaffer's incredible collaboration The Fourth Messenger in March of this year, and now The Song of the Nightingale! M: You have also worked as a producer for theatre productions. What do you enjoy about working as a producer? Are there any insights you've gained from working as a producer that informs your work as an actor? A: Yep! I've happily been serving on the artistic production team of Ray of Light Theatre since 2009. First as an Associate Producer, then Executive Producer and then after our reorg last year, Finance Manager. I got into production, initially because I had zero background in theater and I wanted to see how it worked. Production for some people is a chore, but I love it! It's fun and incredibly important to any show moving properly. It must have something to do with the part of my brain that also really loves architecture; the artistic combined with the technical execution. I really enjoy problem-solving and helping to see pieces of a show come together - from the design to casting to rehearsals. It's a wonderful thing to stand at the back of a house on opening night, seeing audience members LOVE your show and knowing all of the intricacies that had to come together perfectly to make that happen. I've recommended this to a couple of fellow cast members, but being on the "other side" and sitting in on an audition or casting has helped me in so many ways. I've started to understand how producers, directors and casting directors think. We don't always cast the best singer or the best dancer; we pick people that fit together. A show is a collaborative group of people that have to be able to work both on stage and off. While it doesn't make the audition process any easier, it makes understanding why I didn't get called back or didn't get cast that much easier to swallow. One of the most important pieces of advice I've ever received as a producer is: "Never say 'no' outright. Always say, 'We'll look into that.'" I think that mantra has really served me in that I start to really consider the possibilities of something I may think is too expensive, too difficult or too ridiculous to entertain at first. What is theatre, honestly, but entertaining the impossible? Say YES! A: Uh...awesome? I've been so incredibly lucky to be part of the original stage read cast that was recast for this run. Over the last two years you've also included me in other readings, and I've been so blessed to see all the developments and iterations of the show. I remember coming home from the Altarena call backs thinking to myself how much I really wanted to be a part of the premiere and how important this story is, right now. To be part of an all Asian cast presenting a new piece of musical theater is nearly unheard of, and I think we're very blessed in that way. Nightingale is also one of the few productions I've been a part of that I can invite my entire family to! I've even had some family members come twice! There's something about this show that speaks to so many people, the themes are universal and very thoughtful. Speaking of family though, this cast is truly one of the most amazing ensembles I've been a part of; I don't think there was one rehearsal - even during tech week - when I didn't laugh hysterically at something that happened or something someone said. It's so amazing to be around such a positive, cheerful and hard-working group of actors. And on the other side, to have people like Christina Lazo and you leading this group through our paces and still taking time to laugh and acknowledge one another is such a gift. It's an experience that I'll carry with me for a long time. M: Describe a little bit about your approach to the character of Madam Wu. How is the character similar to you? Different? A: We've talked about Madam Wu being a throwback to traditional Asian female values; demure, soft-spoken, conciliatory and that she really needed to come across as initially weak. She's the power behind the throne but honoring her mother's dying wishes gives her a bit of a martyr complex. She goes a little too far with kowtowing to the Emperor. Instead of confronting him on what she knows is the right way to run the country, she just does all the work herself. She thinks she's doing the right thing. It's challenging to play someone who actually has a ton of power and say in the court, but isn't supposed to appear powerful. There's a danger of making her come across with modern "lean in" strength values, so I had to learn to pull that way back. I think it's so much harder to do that because of a personal internal struggle to marry traditional Asian values with what is currently being touted in Western Society as the "right" way to get to the top. In this story, Mei Lin is an instantly recognizable heroine for modern girls - she's feisty and ambitious which Madam Wu responds to and admires. Madam Wu has to go through her own transformation from a placating doormat to her own personal hero. She doesn't really have the room to wear her heart on her sleeve, but I've tried to find moments where her true feelings come through. I think people can relate to having to hide their feelings for the greater good. I personally admire how much tenacity Madam Wu has to put up with her brother for all those years, which she does out of love - not only for her country and family but also, truly for her brother. Madam Wu and I share a lot of quiet strategic thinking. She's the type of person to really observe and reflect on situations before acting. I adore that Madam Wu is so adorably awkward, and I think that's what helps her be so likeable; she's a complete spaz, but as she comes into her own she starts to embrace her own image. I'm definitely one of those people who will trip over her own feet, so that's very me. M: I'd like to add that Madam Wu truly has a special place in my heart. Her coming into her own reflects a lot of my internal history and story. And, I have gotten feedback from a handful of people who really identified with her. In the scope of the grander story, I do wish we could spend more time with her - but alas, the show is already the length of a pre-1960's musical, and for most audiences today that's long enough. A: I'm really sad that 'Running the Palace' [Madam Wu's song in previous iterations of the show] was cut. One of these days, I intend to write a one-woman cabaret show and I'll be asking if I can include it. M: I'll tell you right now - of course you can include it! Anything else you'd like to share? Alexis singing "Running the Palace" for the 2010 staged reading. Unfortunately, the song was cut from the show. A: Little known fact, I was not the original Madam Wu. I auditioned, but there was another actor cast in the staged reading that eventually left for a long-term gig. I went to see a friend of mine in Altarena's production of I Love You, You're Perfect, Now Change, which you music directed. You saw me in the audience, came down to chat with me and the rest is history! So lesson learned kids: SEE YOUR FRIENDS' SHOWS!! You never know what's going to happen! It's been something that a lot of other cast members said, but I am so grateful to you, Christina and Altarena Playhouse for including me in this production. An original work, 20+ years in the making that has great story, book and music comes along so rarely. Everyone who's worked on this show has thrown their heart and soul into it; from the crew, designers, to musicians, and the community is really responding! Sold out shows and extensions are the best compliments we could ever receive for a job well done. Here's to you Mr. Kahng and to the many, many more to come. M: Don't forget the standing ovations you've all received as well! Thank YOU for being a part of this show and for taking the time to share your thoughts! 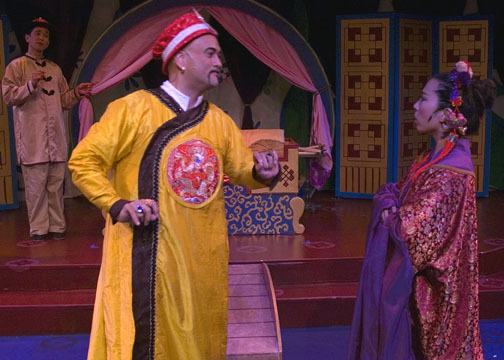 Posted on November 15, 2013 by Min Kahng and filed under Creative, Musical Theater, Nightingale, Performing Arts and tagged interview The Song of the Nightingale Alexis Wong.